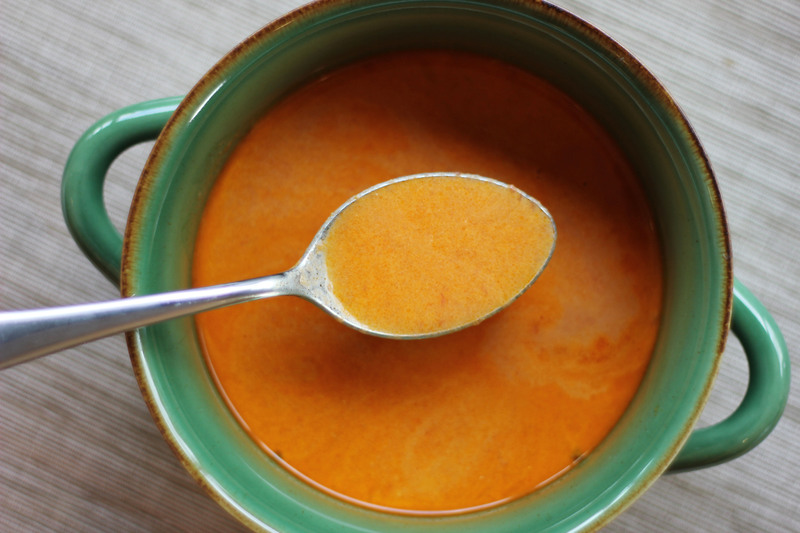 Even though these summer days have been hitting 90 degrees, I can’t help but crave hot tomato soup. Especially when it’s homemade. 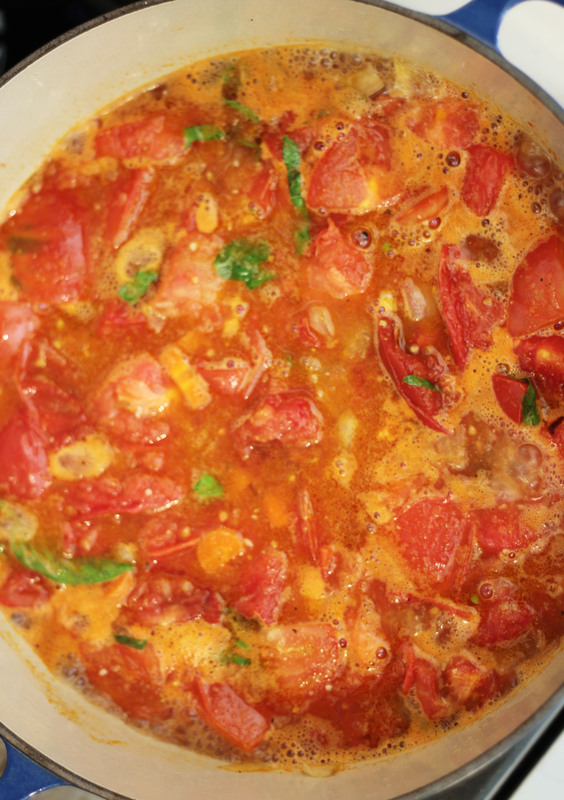 I followed Ina Garten’s Cream of Fresh Tomato Soup recipe, and I was very pleased with the results. 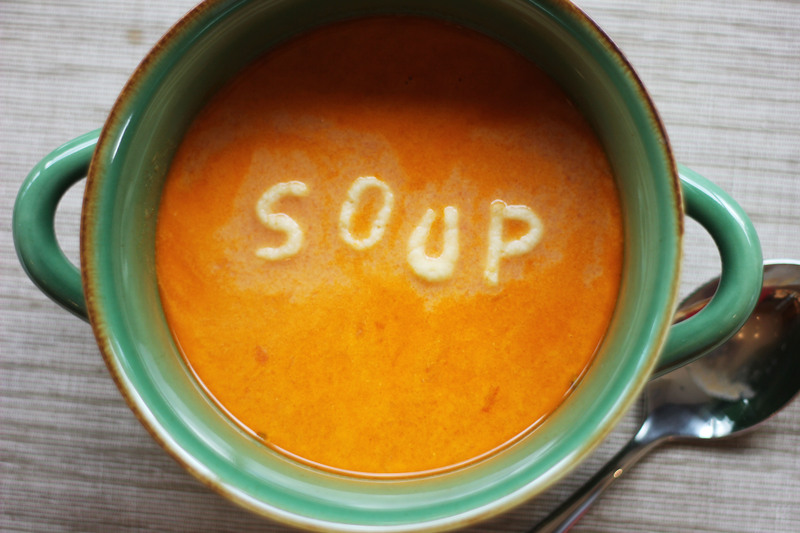 I prefer chunkier tomato soups with vegetables and herbs, while still maintaining a somewhat smooth texture. Soups that taste like all of the ingredients were freshly picked from the garden are unbeatable. This recipe was everything I could have wanted and more. 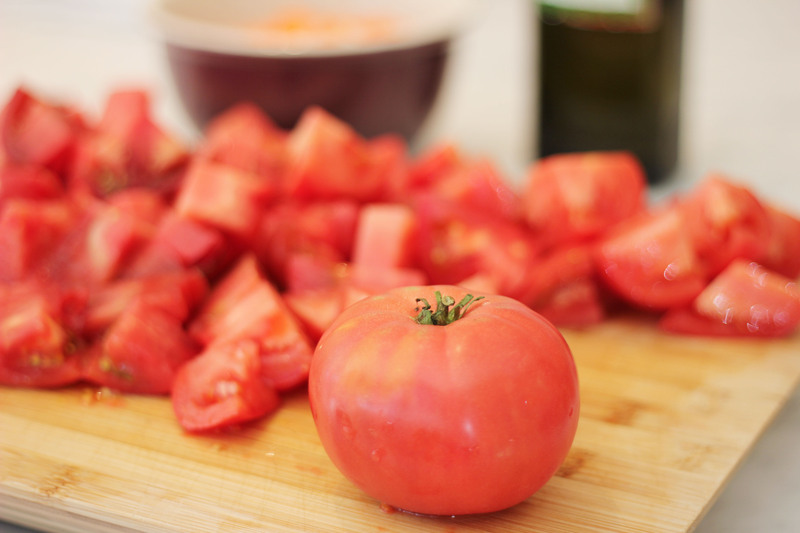 I recommend using heirloom tomatoes for a heartier and juicier dish. To top it all off, enjoy this soup with Homemade Cheese-Its. If you are not ready to say goodbye to Christmas just yet, enjoy a little Fettuccine Alfredo with a wonderful romantic comedy. While watching The Holiday, one of the best modern Christmas movies (in my opinion), Kate Winslet’s character, Iris, tells Jack Black’s character, Miles, that she will make him some ‘Christmas Fettuccine’ to lift their low spirits due to relationship problems. This pasta dish makes an appearance in the scene with Cameron Diaz’s character, Amanda, when she settles in for the night. I made some of this delicious Fettuccine Alfredo, but since the color palette of the dish is predominantly yellow, the pictures were a little boring. To spare you from the dull sight, I chose not to feature the step-by-step for this Eat & Watch. Also, the recipe is pretty basic: make pasta, add the cream/butter/cheese sauce. Fettuccine and The Holiday are delicious and welcomed additions for cold winter nights. 1. Cook the pasta in a large pot of boiling salted water until tender but still firm to the bite, stirring occasionally, about 4 minutes. Drain. 2. Stir 2 cups of the cream and the lemon juice in a heavy large skillet to blend. 3. Add the butter and cook over medium heat just until the butter melts, stirring occasionally, about 3 minutes. Remove from the heat. 4. Add the pasta and toss. Add the remaining 1/2 cup of cream, and Parmesan to the cream sauce in the skillet. 5. Add the lemon zest, nutmeg, salt, and white pepper. 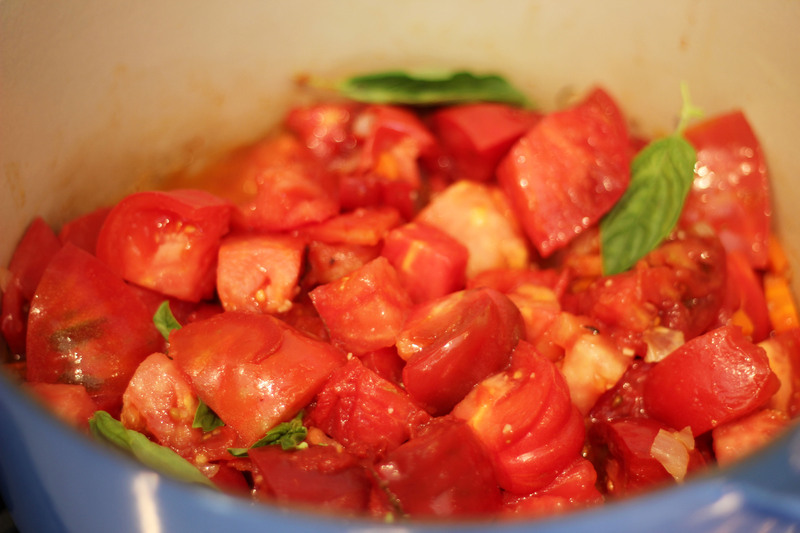 Toss the pasta mixture over low heat until the sauce thickens slightly, about 1 minute. Palmiers are a sweet and delicate pastry that are a great compliment to a large cappuccino. These French pastries are best when soft and flaky, but I have frequently tasted a hard and crunchy palmier which just aren’t as enjoyable. Inspired by Water for Elephants (2011) because palmiers sort of resemble elephant ears, I attempted to make my own palmiers using store-bought pastry puffs, and they turned out better than I had hoped for. Pastry puffs from the grocery store are delicious and great if you don’t have the time and patience to make the dough on your own. 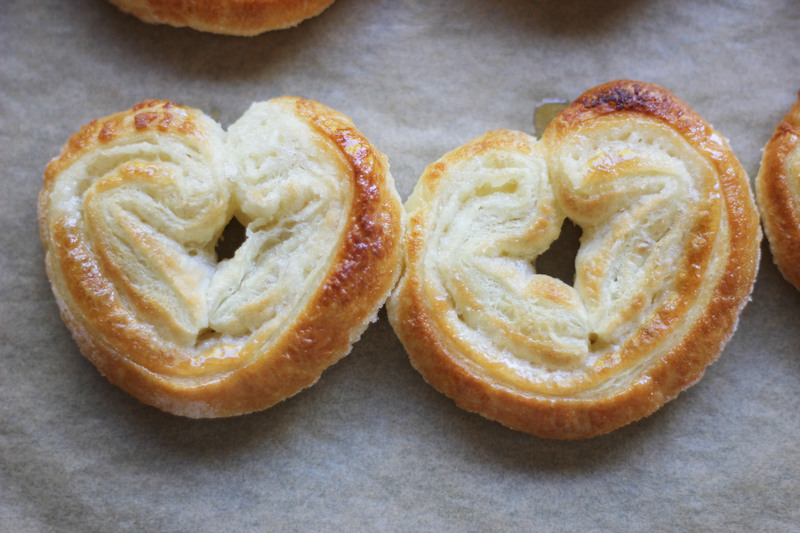 Palmiers don’t take too long to make and are a sweet and fun treat to eat! 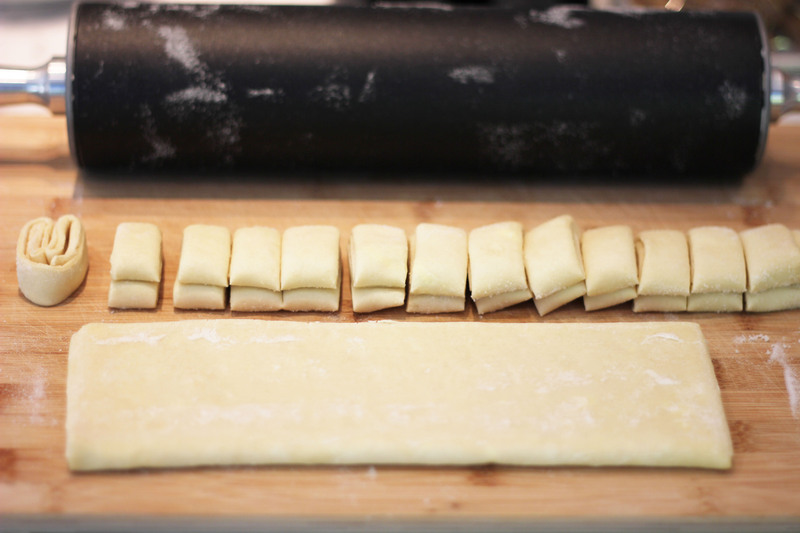 Evenly distribute 1/8 cup of sugar over one side of the puff pastry. 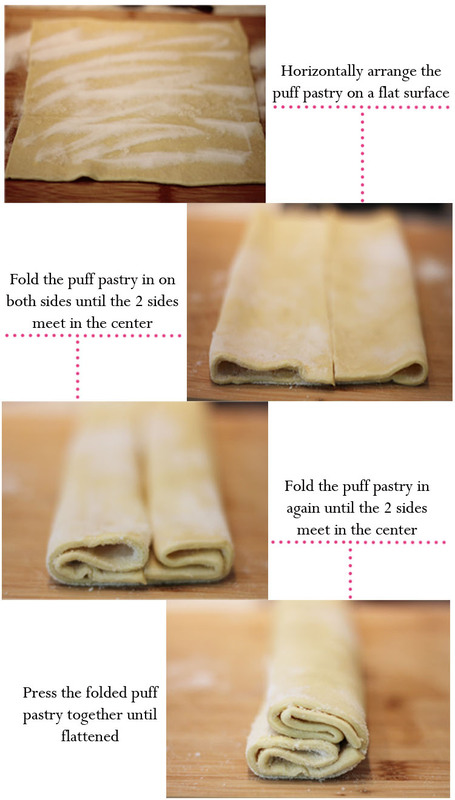 Flip the puff pastry over and spread another 1/8 cup of sugar over the other side. Follow the guide above to create the shape of the palmier. 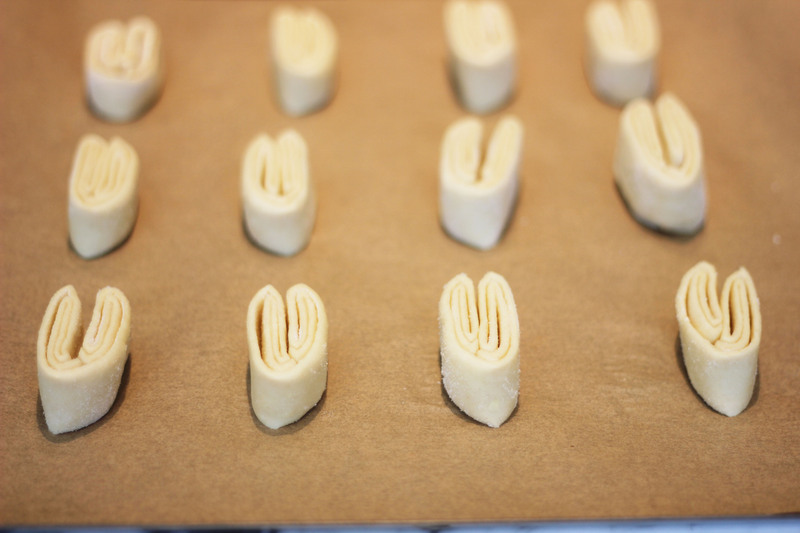 Cut the pressed puff pastry into 1/2 inch pieces. Tip: If the 2 sides aren’t sticking together, run a drop of water along the pastry to keep it from spreading apart when baking. Arrange the puff pastry on a non-stick baking sheet or parchment paper, giving them a couple of inches between one another to expand in the oven. After baking for 15 minutes, set the oven to broil for no more than a minute – this will brown the top of the palmier and make it a bit more crisp. I am constantly finding inspiration from films for new recipes. I have had this idea/recipe floating around in my mind for a couple of months now, and I just needed the time to do it. Inspired by Bringing Up Baby (1938), I created a leopard cupcake since the movie is, after all, revolved around finding Baby, an heiress’ pet leopard. 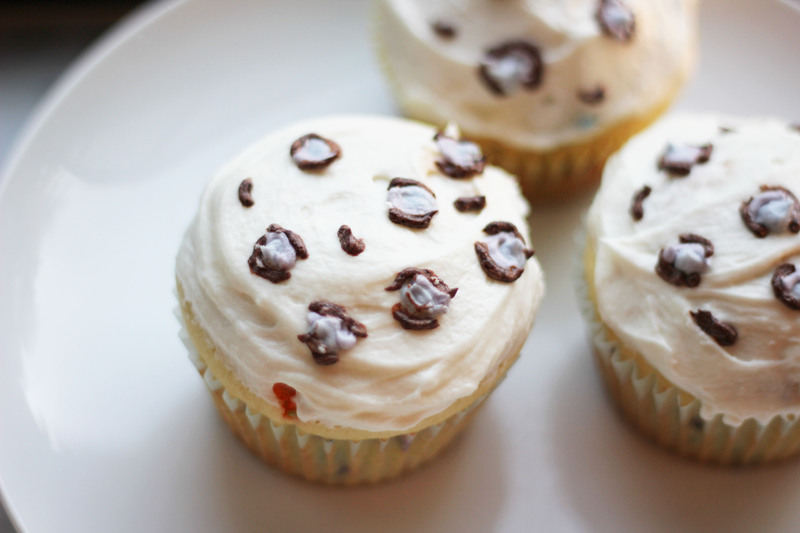 I made a simple vanilla cupcake and added rainbow sprinkles to serve as the leopard’s spots, as well as created a topping that resembled leopard spots – just more colorful. Make the cupcakes. I followed a simple vanilla cupcake recipe (below), and then added rainbow sprinkles to create a “spotted” leopard effect. 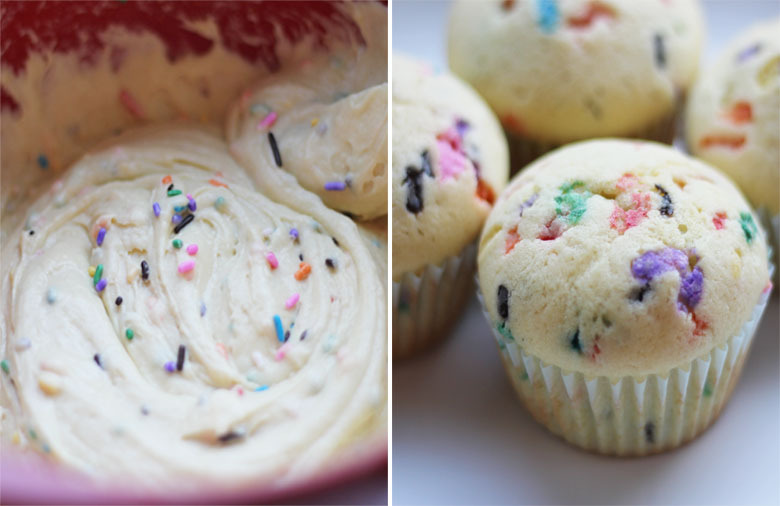 Tip: Fill the cupcake liner 3/4 full of batter – this will give you a puffy dome effect on top of the cupcake. 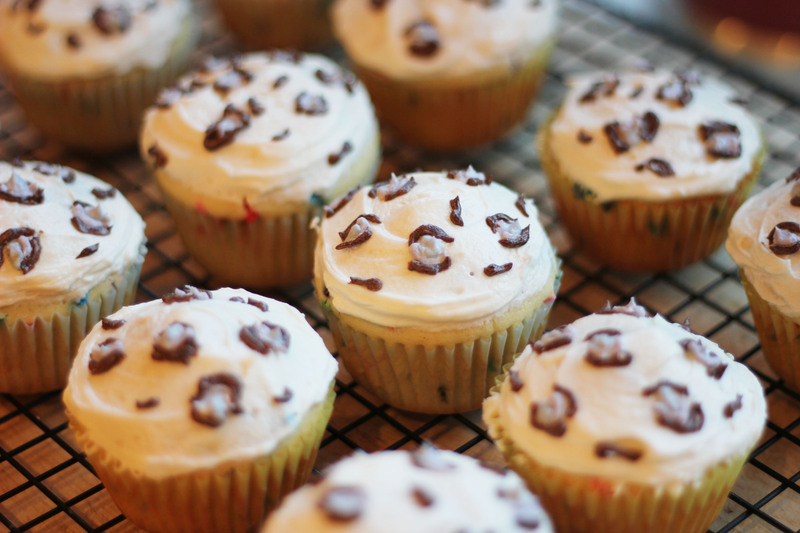 While the cupcakes start cooling, start making the cupcake frosting (recipe also below). This is one of the best parts because it involves a lot of butter and sugar and food coloring. 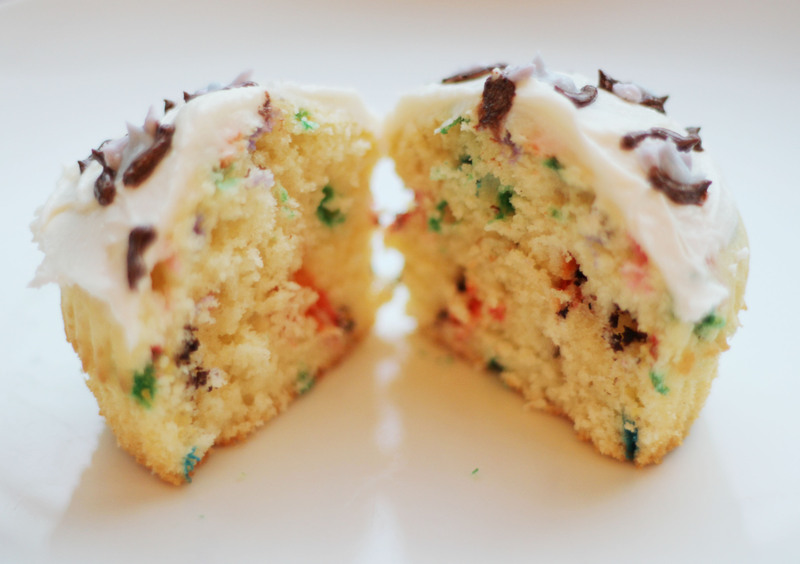 Once the cupcakes have completely cooled, spread a layer of frosting over each cupcake. I kept the frosting white for this part so that the leopard spots would stand out, but it can be any color you choose. Don’t Forget: Set some frosting aside for the leopard spots – I set aside 3 bowls (since you’ll be using 3 colors for the spots) filled with a little more than 1/4 cup of frosting for 12 cupcakes. Once the cupcakes have been frosted, set the cupcakes aside. It’s time to focus on the 3 bowls of frosting. Now you get to choose which colors you want to create using food coloring. I wanted a light blue and lavender spot with a dark brown edge. I used 1 blue and 1 red drop of food coloring for the lavender, and 2 blue and 1 red drops for the lighter blue. You can also add more white frosting to create a lighter color. Once you have your colors mixed, use your decorating tools for a detailed effect. I used the smallest tip in this decorating kit so I could have more control over what I was designing. Tip: When you have such small frosting proportions or run out of icing bags, just use a small ZipLock bag to hold the frosting. 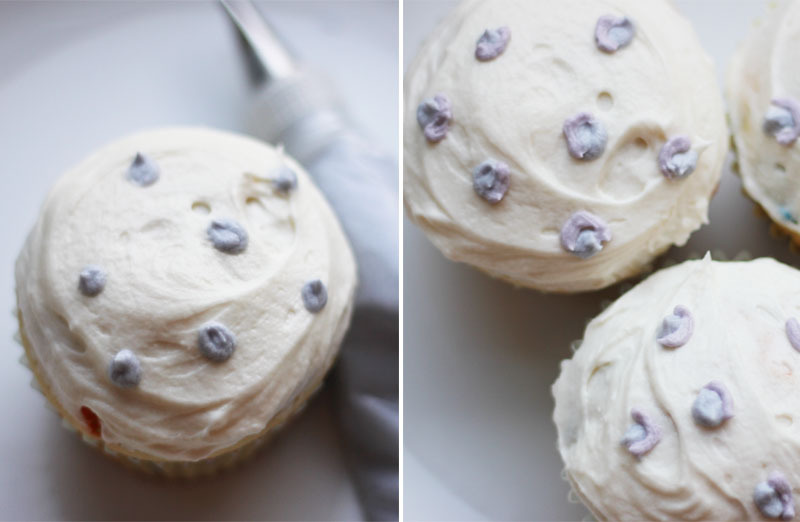 The first thing you’ll want to do to create a leopard spot is make small circles all over the cupcake with one of your frosting colors [picture on left – I used the light blue for a circle]. Once all of the cupcakes have the first color, you can add the second color. Instead of a circle, create a shape that resembles a parentheses [picture on right – the second color I used was lavender], outlining only half of the circle. It’s okay if your circles aren’t perfect, you want it to look natural. For the finishing touches, use your third color to outline the two-colored spots you just created. You don’t want to completely circle the spots, but enough to give it a leopard look. At first I made my darker spots too thin, so I went back and made the edges thicker. Add small random squiggles so the spots aren’t standing alone. These spots are surprisingly simple to create; the only time-consuming part is the details on the spot, but somehow I find it relaxing. The best part about these cupcakes is that you can make them all different colors and because the spots don’t need to be a perfect circle, there is room for mistakes. * Pre-heat the oven to 350 degrees. 1. Beat the butter and sugar in a bowl with an electric mixer, or you can mix by hand. 2. Add the 3 eggs, one by one, and mix well after adding each one. 3. Add the vanilla extract to the mix. 4. In a separate bowl, mix together the flour, baking powder, and salt. 5. 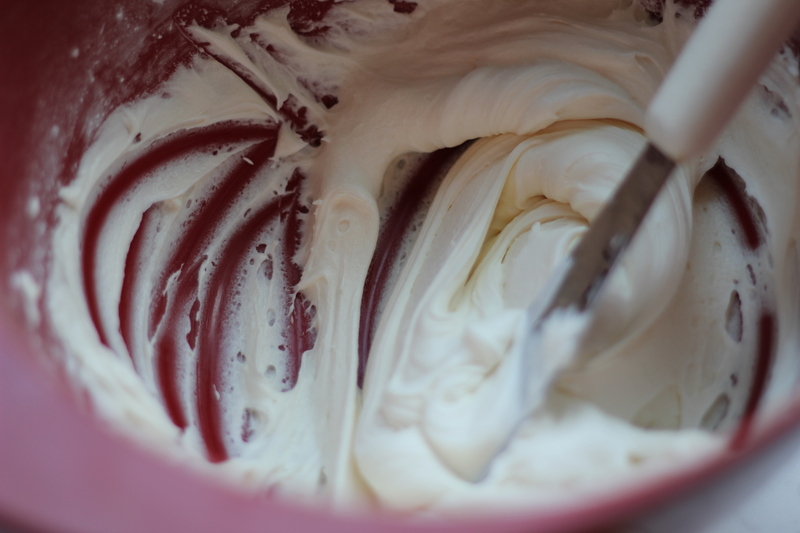 In the bowl with the electric mixer, add the flour and milk – alternating between the two, ending with the flour. 6. Beat the mixture until smooth, and then fill the cupcake liners 3/4 full. 1. In a bowl, mix the butter and vanilla extract together. 2. Add the powdered sugar in little by little – if you add too much at once the powder will go all over. 3. Add the milk and blend the mixture until it is light and airy. Add more milk if the frosting is not fluffy enough.